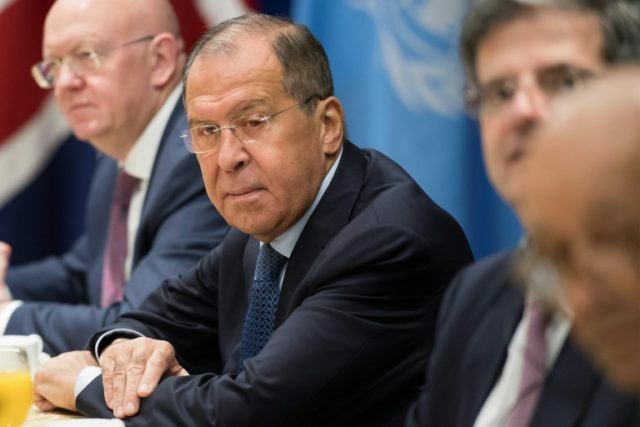 Russian Foreign Minister Sergey Lavrov’s rebuke comes as the two countries are suffering a fraying of ties following an Israeli strike on September 17 that resulted in Syrian forces downing a Russian plane, killing 15 Russian crew members. Russia at the time accused Israel of using the spy plane as cover, a claim Israel denies. Although Israel and Russia have generally coordinated their respective military actions in Syria, Jerusalem has made it clear that it does not need Moscow’s approval before carrying out strikes there. Nevertheless, Lavrov blasted Israel for not upholding its commitment. “Unfortunately, the Israeli side did not always strictly comply with its obligations, especially as regards the obligation to notify the Russian military about combat operations in Syrian territory,” he told the Spanish-language El Pais in an interview published Monday. He added that IAF strikes in Syria in recent years have put military personnel in danger. “On several occasions this endangered the lives of our military in Syria; for example, in the Israeli aerial bombardment in the region of Palmyra in March 2017,” added Lavrov, referencing the raid on the T-4 air base near Palmyra in central Syria, which Israel said housed an Iranian drone program. Israel has asked Moscow to help prevent further military entrenchment in Syria by Iran and its proxy, Lebanese terror group Hezbollah. Lavrov told El Pais that Israel’s actions in Syria would not help in attaining this goal. “We warned in all ways and at the highest level [to the Israelis] that such an attitude could lead to tragic consequences. At the same time, we emphasize that acts of force contribute to increasing regional tension and cannot solve the security problems that concern Israelis,” said Lavrov. “However, [the Israelis] continued to bomb targets in Syrian territory and that was what led to the tragic demolition of the Russian reconnaissance aircraft Il-20 with 15 officers on board. After the incident of September 17, we could not leave things as they were. Russia responded in a contained but firm manner,” he said. Since Russia’s delivery of advanced S-300 systems to Syria, no reports have emerged of Israeli strikes despite Prime Minister Benjamin Netanyahu insisting last month that the air defenses would not deter the IAF. However, Defense Minister Avigdor Liberman said that the lack of news coverage did not mean that raids were not carried out. In early October, it emerged that Russia had supplied Syria with three S-300 anti-aircraft battalion sets with eight launchers and more than 100 surface-to-air guided missiles each free of charge.